Gone are the days when we used to walk aboard an aircraft with our 5 foot rod cases, tackle boxes and bags full of heavy reels. Carry-on is now limited to one piece of luggage and a personal item. We used to say “no way I’m checking my flies onboard, what if they were to get lost. it would ruin my trip!” Now fish hooks are considered to be possible weapons. 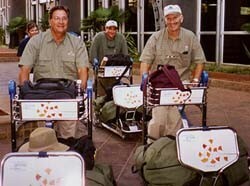 Angling travelers have given up trying to work around the strict carry on limitations and have begun to pack everything in checked baggage. At least they seem to be very fair about allowing photography gear in carry on baggage, but who knows what the future holds. The trick is to be much more organized about your packing. You must consider that on at least half of the flight legs, your baggage will be searched and gone through by security officials. It’s a big pain for them as it is for us, but in this day and age I haven’t met anybody who would like security relaxed while they are travelling, either international or otherwise. With conventional packing methods, clothing is folded, rolled and stacked, shoes and other items are stuffed into the corners and fishing gear and somewhat fragile items are stuck between clothes to protect them from getting banged around in the luggage handling process. This is all great until security opens your bag and digs around looking at all of the possible hiding places. Your clothes are all unfolded and any items packed for protection are now floating around in the bag. We have a few ideas that will help you travel more comfortably, hopefully arriving with all of your gear intact and undamaged . Soft-sided duffels are by far the most accepted luggage for fishing and adventure travel. Any use of small aircraft in the itinerary will require soft luggage to allow for proper packing in the small luggage compartments. Soft-side bags wth wheels have become popular because they are easy to wheel through airports. These are fine unless your baggage weight is limited. Most fly-in operations have a 40-50lb weight restriction and most of the bags with partial frames and wheels weigh at least 10lbs more than a standard nylon duffel. That’s 20-25% of your allowance. Bags with wheels are great for destinations with all major flights, but impractical for more remote destinations requiring small aircraft. I suggest that you pack in a well made, 36” long heavy nylon duffel with a strong, rubberized bottom. There are many choices, some with outside pockets some without. I prefer to only have one main zipper. I also pack a second duffle, which weighs about a pound and is rolled tightly in case of a bag blow-out or my wife’s inevitable discovery of something she cannot live without and that needs to be checked in for the return trip. New regulations have had the biggest impact on what we can carry onboard the plane. Full sized jets are a bit more tolerant of carry-on size and weight, but they request that you put one bag in the compartment above your seat and one under the seat in front of you. I personally cannot stand to have a piece of luggage robbing me of whatever little leg room is available, so lately I have been trying to keep my second piece or “personal item” as small as possible. I carry my cameras aboard in a Pelican 1500 sized case and then a very small piece with my tickets, passport, eyewear, medicines, latest good book, earplugs, sleep-shade and I-Pod. It takes up about the same space as a shoe-box. 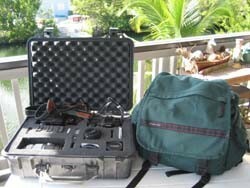 The Pelican case just fits in the overhead of the smaller regional jets and prop commuter planes. On weght restricted trips with lots of small planes I use a special Tamrac camera back pack that offers as much storage space and adequate padding for camera bodies and lenses. There’s room for all of the accessories and a compartment on top for few other items. We all love to fish with our own favorite rods and reels. Most of us choose to bring gear even when the lodge provides fishing outfits. This means that you either have to pack your rods in a sturdy check aboard rod tube, or fish with 4 and 5 piece rods that can be packed in your main check-on duffel. Rod manufacturers have been quick to see this need, so most major brands have rods that break down small enough to allow this. I have made a couple of home-made tubes from 3”, 4” or 6” PVC tubing with simple plastic end-caps. I bulid them as long as my favorite duffel will alow. There is often enough space on the end to pack a reel or two or something else that needs protection. I use the thinner walled type which is lightweight and plenty tough to protect the rods. I have yet to have a rod damaged when packed in this manner. It is easily opened for inspection and so far “knock on wood” the rods are replaced and the caps reattached. I have become very fond of soft style fly notebooks and tackle organizers. Unlike plastic fly boxes, they do not crack on impact and I can carry many more flies. 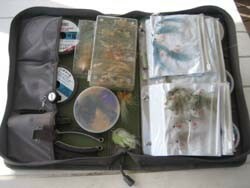 Some tackle organizers are very well designed and can carry everything you need for a day of fishing and are practical for packing as well. A good friend of mine, Gary Raphael, actually removes the treble hooks leaving only the split-ring, and packs the hookless lures in a plastic bag. He can carry dozens of lures, Rapalas, Rattle-Traps etc. The treble hooks are put in a bag, that when done takes up a space the size of your fist. Re-assembling the lures takes a bit of time, but the end result is being able to bring all the sizes and colors you want. Gary has always been a master at packing light. When leaving for a trip, I almost always ask him. “where’s the rest of your stuff”. He never seems to run out of stuff during a trip. Reels can be packed in Tupper-Ware containers, or an old padded camera bag that nestles into your duffel. I prefer the latter as this keeps your new Tibor from ending up on the side or bottom of the bag with nothing but nylon between your reel and disaster. Go to the grocery store and buy a couple boxes of Freezer weight zip-lock bags. One in the one gallon size and one in the two gallon size. 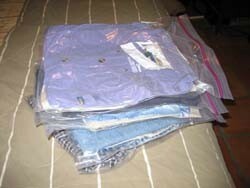 Using the two gallon size, neatly fold your shirts, t-shirts, pants, shorts and then carefully place in the bag. I usually put an outfit, like a pair of pants and a shirt in each bag. Or a couple shirts in each, underwear in one, socks in another, etc . Zip the bag shut leaving one inch open. Lay the bag on a soft chair or bed and sit on it with the zip-lock side facing forward. Reach down and zip the last inch. The result is a packing unit that is vacuum packed, takes up half the space and when stacked with the rest of the clothing packed “modules”, is organized like a file cabinet. Security can see through the bags, so they are not apt to open them. I have left shirts packed this way for several months, opened the zip-lock and found a nicely ironed shirt that just needs to be hung on a hanger for a few minutes to look like it just got back from the cleaners. This technique works great when you are at a destination that requires that you live out of your luggage for lack of drawers. I pack shoes end to end in the bags and use a couple extras for stuffing my dirty laundry. I use the gallon size for sunscreen, bug dope, soap or any other liquids. Put the plastic bottles in, roll the bag tightly around the contents and put a couple heavy rubber bands tightly around the package. Then you put the package in another zip-lock, roll it up etc. Very leakproof and takes up very little space. Light rain-gear can be folded and treated like shirts and pants. With your baggage packed this way, the contents are water-proof and dust proof in case it gets rained on or falls out of a dug-out canoe in transit. If you are going to a colder dlimate requiring more luggage space for heavy sweaters, jackets, rainwear or waders, it is best to go to a second duffel to keep wet and dirty gear separate from the rest of your clothes etc. I always roll up a couple of heavy garbage bags and throw them in this bag for separating wet items. If you are bringing a super-heavy jacket, wear it on the plane instead of packing it. This will give you more packing space. Make several copies of your passport’s front 2 pages. Leave one with your contact at home, put one in your check-on bag, one in your carry-on and give one to your travel companion. This is to protect you from getting stuck somewhere without identification because of baggage loss, theft of your wallet or other unforseen events. In the worst case you can call home and have a copy faxed to you. On the one you leave in your checked luggage, write you home address and phone number along with the address and phone of your destination. Often baggage gets lost because of an ID tag and or airline destination tag getting ripped off when on airport conveyor belts. When at the counter, checking your baggage on, be sure to take one final look at three letter destination that the agent puts on your bag. Make double-sure you and your bag are going to the same place! Before packing your carry-on, be sure to carefully go through it looking for anything like a pocket knife, scissors or fish-hook that might be left over from a local trip. Wear a pair of shoes that easily slip on and off while travelling. Most time when going through security check-points, you will be asked to take off your shoes. If your time allows, schedule your trip to arrive in the destination city a day early. Not only does this give you a chance to wind down, but it also allows any delayed baggage to reach you before you leave for the fishing location. On the return, try not to sechedule important events or meetings for the first day back in the office. Take the pressure off travelling. This is definitely one thing you can control. 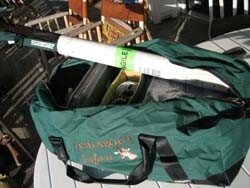 When checking in a large rod case, it will count as one of your two bag checked limit. If you are travelling in a group, duct tape several rod cases together and call them one piece as long as it doesn’t go over the weight or size classification. After every trip, make a list of items you forgot to bring that would have made you better prepared and then a list of the things you should have left home. My “should have been left home” list is always bigger than my “forgot to take” list.